Off of U.S. Hwy 26, our Sandy location serves the town and every hungry driver that passes through it on their way to Mt. Hood National Forest. Just off Highway 211 and Larch Rd, we provide pizza to the very heart of Clackamas County. Stop in for a special or make your own combo pizza. From SE Hwy 212 and SE Royer Road our pizza feeds the entire N. Clackamas County corridor. Trust us. Our pizza is worth the drive. Located on SE Belmont St and SE 8th Avenue, our flagship location is proud to inhabit the legendary Grand Central bowl building and serve all of SE Portland. Our North Portland location provides tasty pizza to Piedmont, Woodlawn, and the surrounding neighborhoods as well as our corporate clients. On MLK Jr. Blvd and NE Brazee St, we serve all of downtown Portland and provide indoor and outdoor seating for diners. Feeling thirsty? We have Oregon's favorite craft brew beers on tap. Nothing goes better with a slice of pizza than a cold one. With a rotating roster of great beer, you'll find something new and frosty every time. Go ahead. Order a slice or a whole pie, a glass or a pitcher, and enjoy the tastiest pizza in Portland the way it should be. It's the only place I will order from. Figaros is straight trash and Hitchin Post is super expensive overpriced trash. Yes sometimes they might not be ready EXACTLY on time, but when u order in the dinner rush what do u really expect? It's not the staffs fault everyone in town orders food at the same time, and they are almost always trying their hardest to keep up. It's the best pizza for the most reasonable price. Finally found decent NY slice! Not too greasy, crisp crust has great follow through, not too heavy. Best slice I have had since fleeing West. Dude. Such good pizza in an awesome environment! Crispy and well cooked pizza, not too salty or oily. $1.99 per slice is pretty good price. A frequent, local customer that I meet in the restaurant says this is a better Sparky's Pizza restaurant than others nearby. Good price + taste good = nothing goes wrong. Hehehe. We were visiting Portland for the weekend and while doing the distillery tour we got hungry. Decided to try this pizza joint. We are glad we did!!! Pizza was phenomenal!!! They have specials twice a day and I love them for it. Happy hour from 2-4 and end of the night one hour before closing. Ordered a Mega-Pak (5 pizzas, bread sticks, and pops) and picked up at the store. Was ready in an hour. Excellent pizza, bread sticks were good, good condiments. Good pizza I'll be sure to come here again when I'm in Portland next. Great pizza and a very friendly staff. I've been going to Sparky's pizza since their 1st location opened in Sandy, Oregon about 20 years ago. 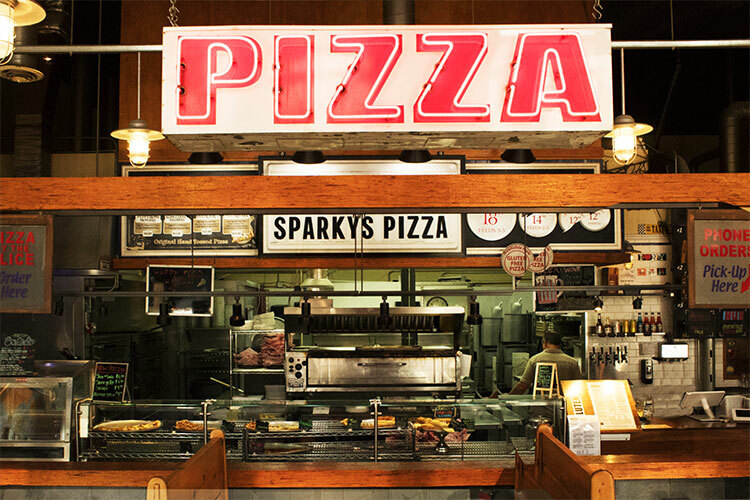 I love Sparky's because they use real fresh Mazzarella cheese and have consistent quality pies. Lately we've been going to the downtown location for their lunch slice and drink combo. It's fast, affordable, and delicious. Ok to start off i can i can eat 3 to 4 slices of pizza in a sitting. I had two and was stuffed. We order 2 pizzas and bread sticks which was a mistake because we (2 of us) couldn't eat even half of one. Perfect ratio of sauce to crust, very fresh toppings. The crust was a little heavy for my liking. Solid 8/10 on quality pizza! Great pizza, good dough and toppings, don't get a giant, they tend to be cooked wrong or crust is too thin. Great pizza, love the complementary pepperoncinis, I ate too many. xD Great service, too! Ready to go pizza slices and more, crunchy crust with tasty cheese blend, reasonably priced and some tables for dining in. Great friendly service and a popular place for locals. This pizza is amazing. My kids beg me to get this for them. I highly recommend. This is one of the few Sparky's that have actual seating as well, which is a nice bonus. Man sizzle pie is high key wack compared to Sparkys. No competition really. Sparkys got that fire through and through. My mans Daniel and hailey treated us right and served the pie up with the quickness. Shout out. My favorite pizza place in town. The food is good, the staff is great, and slices are reasonably priced. Mondays and Tuesdays they have good specials on whole pies, and they have a decent selection of booze on tap. Not a good spot to buy a salad, though, so stick to the carbs. I love sparkys. Deliscous pizza, good breadsticks, and the ranch..... omg the ranch. Great selection of slices with red or white sauce, and everything from pepperoni to chicken, bacon, BBQ, Thai, etc. I love their pizza and the big bread sticks! Awesome pizza. Catch the Happy Hour deal for $2 slices! I dropped by at 4 minutes to close and they cheerfully helped me not starve to death. And, the pizza was actually really good. Incredibly delicious pizza and very reasonably priced. I highly recommend Sparky's to anyone that is looking for a consistent and never disappointing pizza served by a friendly staff. Thanks guys, for being my #1 go to pizza joint for so many years and many more to come!! I'm a big fan of thin, crispy crust and lightly sauced pizza. This place is perfect for that. I had a slice of the pepperoni, sausage and olive and the flavors were great. My favorite Portland pizza joint. Great atmosphere, killer prices, awesome pizza. Would recommend to any pizza lover. Best breadsticks in Portland! Only downside is no air conditioning so it's an oven in here on hot days. Our mission? Deliver the best fresh pizza at a price people can afford. Pizza shouldn’t be a luxury; it should be a dietary staple. New York’s first pizzeria did so well because an honest slice of pie could be purchased by anyone. We’re proud to continue that same tradition, offering fresh, crispy, and delicious New York style pizza for pickup. Grab a single slice or a whole pie at any of our locations. If you call ahead we can typically have your entire order ready in 10 to 15 minutes. Single slices are always hot and ready to go. Whether you are a die-hard Blazers fan or cheering alongside the Timbers army, we've got your pizza needs covered. Stop by our Belmont or Brazee locations and catch all the games while enjoying a slice and a pint! © 2019 Sparky's Pizza All Rights Reserved.